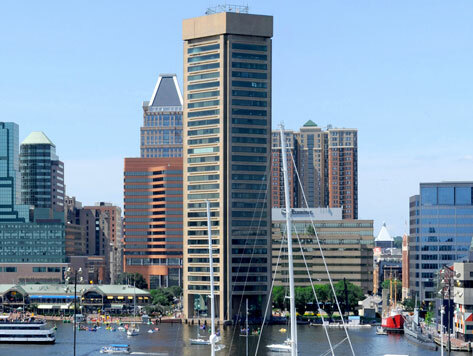 Baltimore’s World Trade Center is an iconic office building and focal point of Baltimore’s Inner Harbor. Built in 1977 by famed architect I.M. Pei, the 31-story pentagonal office tower stands as the world’s tallest five-sided structure. Located on the 27th floor is the Top of the World Observatory where visitors can enjoy a spectacular 360-degree panoramic view of Baltimore’s skyline, harbor, and beyond. Just steps from the building are some of Baltimore’s most popular attractions, including the National Aquarium, Pier Six Pavilion, Port Discovery Children’s Museum, and the Baltimore Convention Center.